The diversity of clients in need of superior commercial exterior lighting requires the contractor to rely upon a source of luminaires that is robust, flexible, energy efficient, easy to install, and cost-effective for the end user to maintain. One of the greatest advantages contractors obtain through partnering with Led Spot is the ability to match the best possible commercial lighting fixture to exterior building areas and surrounding the property on site. Contractors who come to Led Spot as their preferred source of commercial exterior lighting fixtures have more options with which to build proposals and offer more delivery power to a broader spectrum of clients in corporate, municipal, academic, industrial, and hospitality markets. Led Spot supplies commercial designers with a large number of area lighting fixtures that bring competitive advantage to the bidding table. These area lights can be obtained in either in either horizontal or vertical orientation fitted with your choice of lamp types and reflectors that in turn can create any number of commercial exterior lighting effects free from glare and light pollution. Led Spot commercial aluminum exterior lights can be ordered in either flat or concave lenses that can provide complimentary lighting of commercial exterior architecture and general outdoor areas. All commercial exterior site lights are engineered to achieve full cutoff in full compliance with standards laid out by the Illuminating Engineering Society of North America (IESNA). Led Spot commercial exterior floodlights to feature superior beam adjustment controls that can precisely control beam diameter and directional placement. Sophisticated reflector designs make these commercial exterior lights capable of generating any number of multi-dimensional lighting effects, giving your proposal a strong competitive advantage when bidding a commercial landscape or high-end resort facility that insists on having their very best face forward to the public. The diversity of style brings that added benefit of aesthetic compliment to lighting systems that require more than basic functionality to win the bid. Led Spot floodlights are made from the toughest commercial grade materials and are designed to endure the elements regardless of climate or geography. Led Spot canopy and ceiling mounted commercial exterior lights feature specific housings for particular environments. This allows you to propose more precise options to a greater diversity of clients, as virtually any type of facility can be equipped with one or more of these custom luminaires. Choose from ceiling lights made specifically for commercial parking garages, canopy lights for retail centers and filling stations, flush mounted recessed models ideal for lighting commercial exteriors around corporate office parks, and fixtures designed especially for pedestrian walkways and building perimeters in civic centers and public recreational buildings. Your clients will greatly appreciate the lower power bills and hours of glare-free lighting Led Spot canopy and ceiling lights bring to their facilities. Maintenance for most of these fixtures is simple and does not require a professional contractor because many of our models can be easily revamped from the ground. Clients will not only benefit from the low-profile and custom aesthetics these commercial exterior lights add to their site lighting, but they will also appreciate the do-it-yourself maintenance savings that our fixtures offer over competing models too complex for the end user to service without a service professional’s help. Wall mounted lights by Led Spot add value to your invoice with more mounting options and more aesthetic compliments to buildings of any size and architectural design. We supply up lights, down lights, and hybrid models for simultaneous up and down lighting with full cutoff distribution of light. Both HID and fluorescent lamping options can be ordered for almost any fixture design, allowing you to address both security concerns and power savings in your commercial exterior lighting system. Led Spot wall-mounted fixtures are also designed for maximum aesthetic presentation. Representing a number of sheik and aerodynamic builds, they superbly light commercial exteriors during evening hours and add complimentary design to building architecture during daylight hours as well. Fixtures can also be mounted at special angles of incidence to extend the light beyond the building perimeters to provide additional security and safety lighting for outdoor gathering areas, walkways, and parking lot boundaries. Any client who is seeking to obtain a LEED certification will greatly benefit from the energy efficiency that characterizes Led Spot commercial exterior wall mounted lighting fixtures. You as a contractor will benefit as well by being able to draw from a diverse reservoir of size options that will allow you to develop commercial exterior lighting systems for multi-building campuses such as schools, municipal centers, country clubs, and resorts. Many of these sites have buildings featuring the same architecture but varying greatly in physical size. When servicing these clients, you can order the same style fixture in small, medium, or large sizes to proportionally match fixture to architecture without compromising the thematic consistency of your commercial lighting design. Led Spot commercial exterior strip lights to produce glare and shadow-free lighting optimal for a variety of important commercial environments. Retail clients often require extra lighting on their signage to attract customers. Building entrances are safer when well lit with a reliable, continuous, and cost-competitive source of evenly distributed light around the entrance to the doorway. Buildings with the company logo painted on the side require vertical downlighting to properly showcase their identity. 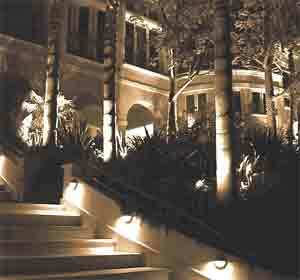 Humid climates usually need special vapor light fixtures to withstand wet atmospheric conditions. When you build your proposal with Led Spot commercial exterior strip lights, you can meet the needs of any or all of these vertical markets with cost-competitive energy ratings, superior functional light, and appropriate aesthetic complement to virtually any commercial exterior you service. Be sure to sing up for our Led Spot contractor community newsletter. In it, you will find periodic updates on new industry technology, helpful installation suggestions, proposal development consultation services complimentary with your equipment purchase, and possible leads on new business.